One of my favorite holiday pastimes is going to see Christmas light displays; I can remember piling in the car with my family and fighting my cousins for a window seat. Christmas light displays are as essential to Christmastime as fireworks are on the Fourth of July… But which ones are the best and how do you find them? Well, we did the work for you! Here is our list of the top 10 Christmas light displays from all over the country and a few websites to help locate great Christmas light displays near you. Robolights is perhaps one of the most eccentric Christmas light displays you will ever see. It’s a combination of artistic fervor and Christmas celebration. Robolights is a creation of artist Kenny Irwin Jr., who claims that it is the “largest residential light display in the country.” Robolights is a different spin on the holiday tradition. A large inflated dinosaur holding a candy cane is just the tip of the iceberg. From microwave carrying wise men, to aliens, Robolights is sure to be a holiday light display unlike anything you’ve seen before. Garden Lights is fairly new to the holiday light scene. It opened five years ago and cost $1 million to launch. Garden Lights stretches across 30 acres inside the Atlanta Botanical Garden and boasts over one million lights. USA Today named it one of the 10 best U.S. public light displays in 2014 and it seems to be getting better every year with 160,000 visitors over its five year run. Inspired by Van Gogh’s famous painting, The Starry Night Walk is something to behold and sets Garden Lights, Holiday Nights apart from the rest. Clifton Mill is a small Midwestern town east of Dayton, Ohio that has one of the most beautiful displays of holiday lights in the country. Clifton Mills has celebrated Christmas with its spectacular light display for over 20 years. Over three million lights illuminate the old mill, banks, and surrounding area. Clifton Mill has a miniature village and Santa Claus museum, but the biggest attraction is the gorgeous 100 foot “waterfall” of twinkling lights. The Louisville MEGA Cavern is a sight to behold in and of itself, but every Christmas season it is turned into a winter wonderland. Lights Under Louisville is the world’s only fully underground drive through Christmas light display. It takes an estimated 30 minutes to drive through the amazing spectacle that is Lights Under Louisville. Customers can drive their own vehicles through over a mile of 850 Christmas displays with two million lights. Silver Dollar City is an amusement park with rollercoasters and other exciting rides. But when most parks close for the season, Silver Dollar City is just getting warmed up. On November 1st of every year the park is transformed into a holiday festival fit for Santa himself. Admittedly, the allure is more than just the lights, but Old Time Christmas boasts five million lights and 1,000 decorated trees. You can come to see the lights and stay for the gigantic Christmas parade with your favorite characters like Rudolph. The Festival of Lights at the Mission Inn Hotel is the second Californian holiday display to make our list. This one is a hit for a little different reason than Robolights. The Festival of Lights finished first in USA Today’s 10 best light displays. The main reason this display is so special is its lighting ceremony; city officials and hotel owner Duane Roberts each give speeches before a fireworks show. The four million lights and over 400 animated figures are a sight to behold. Gift of Lights is your standard light display with one fun caveat; it’s situated around the 1.5 mile oval track. Not only are you experiencing the 600 light displays, but you are also driving on the same road that NASCAR drivers race on. The Gift of Lights is known for its amazing tunnel of lights and its heavy involvement in local charities. A portion of the proceeds of each ticket sale will benefit Toys for Tots, Ronald McDonald House and the Boy Scouts of America. Hot cider, Christmas carolers, and the Rocky Mountains are combined together to make a beautiful holiday experience. Blossoms of Light is one of two light displays offered by the Denver Botanic Garden. What propels the Blossoms of light higher than the Trail of Lights is its use of technology. HoloSpex glasses will magically transform the lights into 3-D snowflakes. Creative “kissing spots” marked by strategically placed mistletoe is another great touch. There is no bigger bang for your buck on this list. The Holiday Festival of Lights is a three mile dive through display that has two million lights. Want something a little different and a lot of fun? For $3 you can hop on the train and tour the park in style. The Holiday Festival of Lights is more than just its 700 displays. Sand sculptures and Santa’s Sweet Shoppe offer more holiday fun. Encompassing Austin’s Zilker Park, the Trail of Lights is a perfect way to cap our list. Since 1967 Austin has been lighting a 155 foot tall tree that is composed of 39 streamers holding 81 multicolored lights. The tree is topped with a double star that displays 150 lights. The tree is at the center of Zilker Park and provides the appropriate backdrop for the elaborate displays. One other great aspect of the Trail of Lights, weekdays have no admission fee. 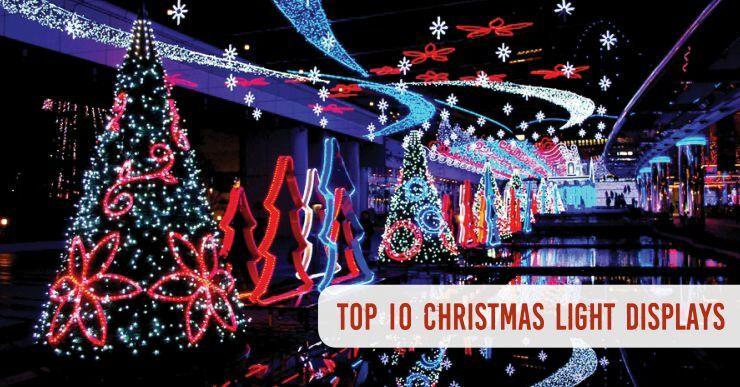 Our top 10 list includes some of the nation’s largest, most popular displays… but isn’t meant to exclude the thousands of fantastic displays put on in communities nationwide – so explore your city, find one near you, and start a new family tradition this year! Did you enjoy our list? Comment below sharing YOUR favorite local Christmas light display! Longwood Gardens in Kennett Square, PA! I love charlestons Festival of Lights but if you drive into Berkeley county to Old Santee Canal park you will find a wonderful light display and lots of family fun!